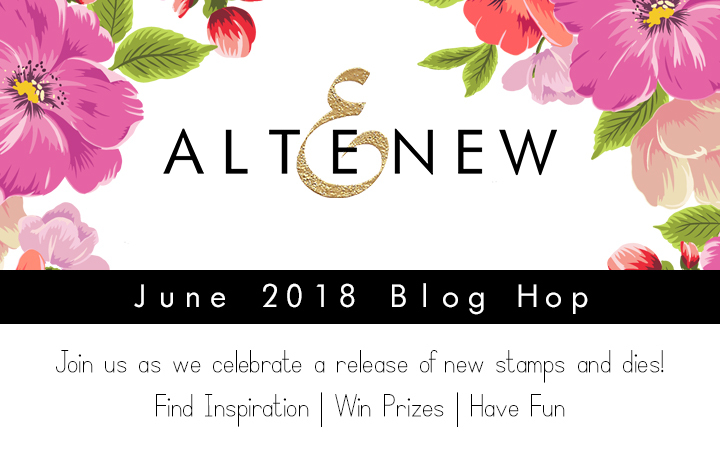 Welcome to The June Release Blog Hop. 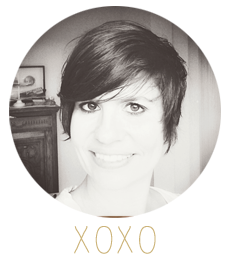 If you have hopped over from Laura Jane's blog you are right on track. I love this month's release and I decided to use the Climbing Clematis stamp. I stamped the flower at the top and bottom and added some leaves around the photo. Some splatters add detail. Instead of stamping the buds in pink I opted to use a more peachy red tone and I'm happy I did. The two work really well together. For the title I did part of it in black and the most important word in green using two ink colours. I'm giving away a 30$ gift voucher. All you have to do is leave a comment by Wednesday 20th. I'll announce the winner here. I love all of the wonderful stamps and dies. Your card is so pretty. I love that you incorporated an image as well. So pretty. I am loving those clematis stamps! So beautiful how they work together to make the flowers. Your scrapbook layouts are always so wonderful to look at. This one is no exception. Love the 2018 release! What a beautiful layout. I love the clusters you made with the stamps. Beautiful,can't wait to use these stamps! love the page you created ~ thanks for sharing! Loving this new June Release...thank you so much for sharing your lovely work!!!! Very beautiful layout. Great release from Altenew. Gorgeous layout! Love those pretty flowers. Lovely layout. My favorite of the new release is the sweetest pea stamp/die set. Wonderful project....such a calming look - TFS! A beautiful layout! Just lovely! What a lovely lay out ! Love how you did this. Beautiful page with the clematis set, love the coral/orange colors too. My fave is the Sweetest Pea set, so unique and begs to be colored in any way. You rocked the clematis set!! What a STUNNING page!! Beautiful project. My favorite is all the flower stamps. Amazing layout. Love the vibrant colors. Nu favourite stamps are perfectly perfect and sweetpeas. So pretty - love the clematis. My favorite set is the Sweetest Peas set. Beautiful layout. I love the bright pops of colours from the flowers, with that soft, serene focal. Great LO! The flower stamps are awesome!!! Hopping on! Such a simple yet beautiful design. Love this! What a sweet layout! I love it!!! 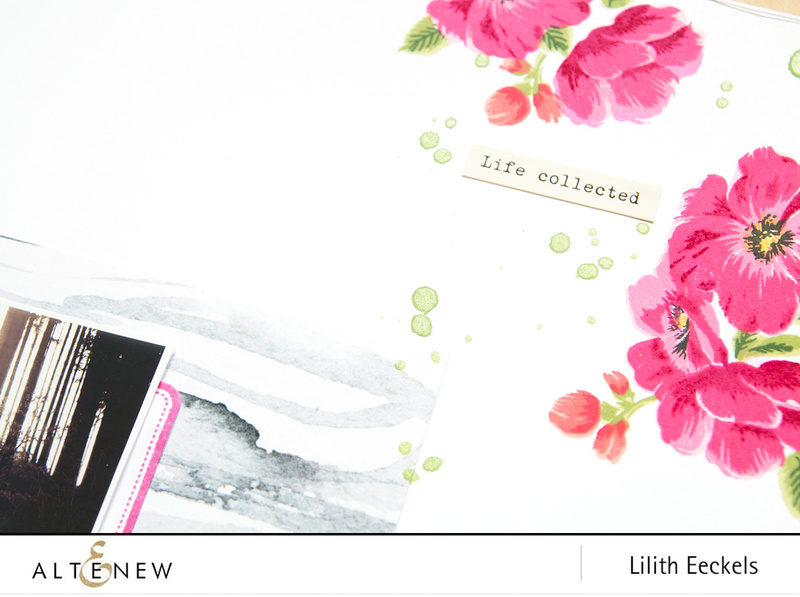 Another beautiful scrapbook page Lilith! I love this. Makes me wish my kids were small again so we could go on adventures. Beautiful layout. That was a gorgeous, simple layout. Just lovely. Thanks for sharing and loving all the layout looks that I have see on this blog hop. Beautiful, as always, Lilith. I love watching and hearing your FB live posts. Beautiful work - love your creativity! Beautiful cards. What is my favorite, I think the sweet peas but honestly there are so many wonderful images in this release..
Love your layout....what a cute little one. Lovely! Really inspiring for me to get some scrapbook supplies out! Great project, thanks for sharing your inspiration! Oh Lilith, the Clematis looks beautiful on this layout. What a gorgeous page! Very well done my dear! I love this layout! I like The simplicity of it and I really love the clematis stamp set from this release! A great release. Would love all of them. Thanks, Altenew. Fabulous layout! I love the clematis stamp set! this release is so full of potential. thanks as always for sharing. Gorgeous page, gorgeous colors. I do love the Climbing Clematis set. I loved your floral background on your scrapbook and all of the sentiments. They framed the little boy so well. I bet he is your sunshine! Beautiful flowers and great layout. Thanks for the inspiration. Stunning layout! Every single element is so perfect. Such a beautiful layout!!! My favorite from this release is the Leaf Canopy. I think it will be so much fun to play with... different techniques, and perfect for both layouts and cards... so versatile! I love your clean and simple style! Stunning colors! I love all the white space on this; it really helps the photo stand out. And the flowers are a lovely accompaniment to the image and sentiment. Thanks for sharing! Beautiful colors. Love the layout. 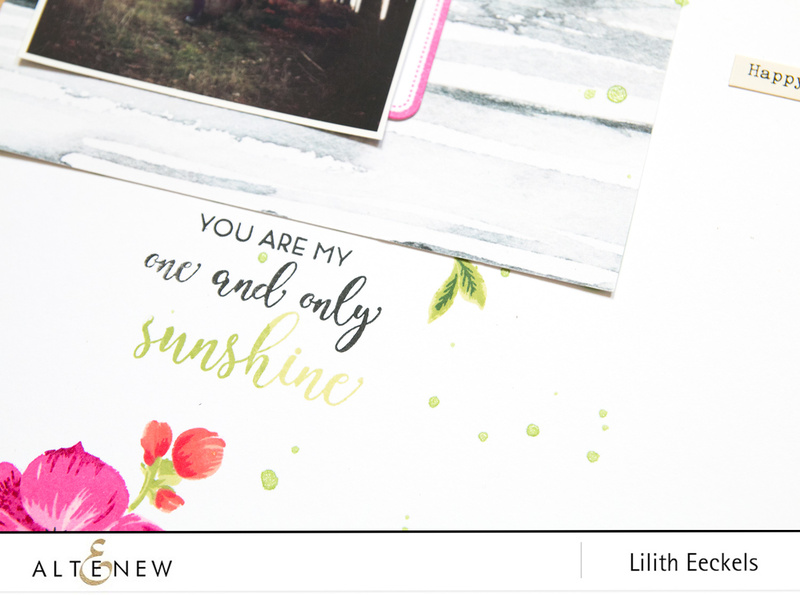 I really enjoy seeing how your include stamping i your layouts! The clematis is a great set. Love the layout. The flowers look so gorgeous! My favorite is the Sweetest Peas set. Absolutely love it! Love, love, love your layout! Those clematis are really gorgeous! Thanks for the inspiration! your creations are always lovely? Oh, I love the pretty pink flowers draping across the page. Gorgeous coloring! Pretty layout! Thank you for sharing! Your page is beautiful! I love the colors of your clematis images; and your sentiment is awesome with the colored sunshine standing out! There are so many great things in this release! I am blown away by all the talent and inspiration! It's hard to choose my favorite item from the release! Love your LO Lilith! Those florals are gorgeous! Thanks for the inspiration! Very pretty layout with these flowers. I love, love, love this! Your open space is brilliant for that photo and the pops of color with the flowers are inspirational! 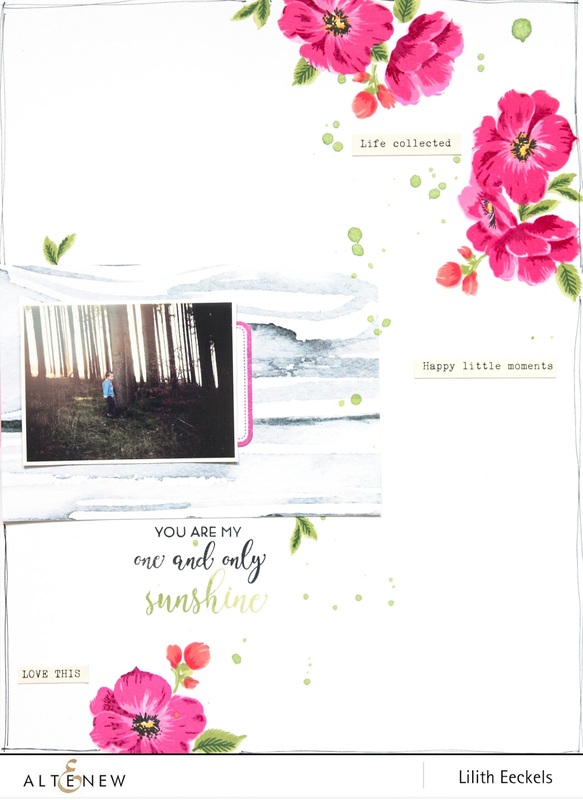 this is so fun and love that you added so many elements on your gorgeous layout! What a beautiful way to use these clematis flowers! Love the bold cards, and your great layout is an inspiration. I MUST start using my flowers on my layouts! Such a pretty layout. My favourite is the Perfectly Perfect stamp set. Thanks for the inspiration. You made a great choice in doing the flower and bud different. It works wonderfully. Love the use of the stencils for the scrapbook layouts. Great colors on your first Scrapbook page... the one with the tribal stencil!